Norshore Atlantic was delivered in March 2014 after successful sea trials. Image courtesy of Norshore. The offshore vessel will primarily be used for riser-less drilling. Image courtesy of Norshore. The vessel can work in both shallow and deep waters ranging from 70m to 3,000m in depth. Norshore Atlantic is a multi-purpose drilling vessel built at the Batam Shipyard in Indonesia by Otto Marine, a company based in Singapore. The vessel was delivered to its owner Norshore in March 2014, following a naming ceremony in February 2014. The vessel is primarily designed to provide riser-less drilling operation, applying known and field-proven technology. It will also operate in the shallow and mid-water segment to drill wells and perform complete subsea field decommissioning (P&A), as well as intervention operations with work over riser and pre-drilling of top hole sections in deep-water. The vessel can operate at water depths ranging from 70m to 3,000m. Designed to operate worldwide, it will carry out its first assignment in Asian waters and will later be contracted by an offshore oil company for three years. Designed by Marin Teknikk, Norshore Atlantic is of MT 6022 XL design. It has an overall length of 115.4m and a moulded breadth of 28m. The depth to main deck is 9m, while the length between perpendiculars is 107.9m. The vessel’s maximum draft is 7.1m and the air draught is 46.8m. The gross tonnage capacity of the vessel is 8,200t and the net tonnage 2,500t, with a deadweight of 7,200t. The main deck of the vessel covers an area of approximately 1,450m², with a 7.2m-long and 7.2m-wide moon pool. Norshore Atlantic received a number of DnV 1A1 class notations including SF, E0, HELDK-SH, DYNPOS AUTRO, DK+, HL (2.8), LFL*, COMF-V(3) and CLEAN DESIGN. The tanks aboard the vessel are capable of storing 1,355m³ of fuel, 202m³ of potable water, 598m³ of drill water, 4,360m³ of ballast water and 1,150m³ of liquid mud. The vessel also features a 500m³ anti-heeling tank, an 85m³ hydrocarbon slop tank and a 10m³ tank for carrying methanol. There are a further two 70m³ and two 77m³ spaces on deck for carrying dry bulk, in addition to space for carrying optional bulk. Norshore Atlantic can accommodate 98 people in 32 one-bed cabins and 33 two-bed cabins. It has two operation rooms covering a total area of 80m², seven conference rooms with a total area of 153m² and five day rooms covering an area of 121m². Other facilities onboard the vessel include a 98m² mess hall with a seating capacity of 58 people, a 32-seat film room and a hospital covering an area of 16m². The vessel features a helicopter deck, with a D value of 22m, built of marine aluminium making it suitable for landing a Sikorsky S-92. 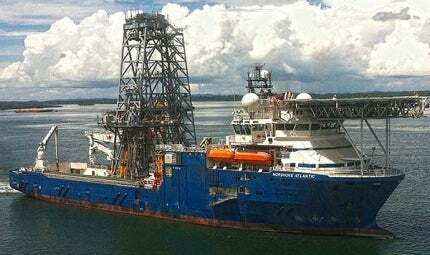 The drilling vessel is further equipped with a Millennium Plus remotely operated vehicle (ROV) supplied by Oceaneering. Norshore Atlantic is equipped with an active heave compensated (AHC) knuckle boom deck crane supplied by National Oilwell Varco (NOV). The main winch provides access to depths up to 2,500m with a lifting capacity of 140t at 12m outreach, while the auxiliary winch has a capacity of 20t at maximum outreach of 32m. "Norshore Atlantic can accommodate 98 people in 32 one-bed cabins and 33 two-bed cabins." The vessel’s NOV derrick crane with a lifting height of 27m can carry a hook load of 300t in two falls configuration and 450t in four falls configuration. Drilling is carried out by means of an NOV HPS-04 500t top drive system with a safe working load (SWL) of 450t at 180rpm. The maximum torque of the system is 55,000ft-lbs at 95rpm. The vessel is also fitted with a 150t Odim ABAS CRC subsea crane for pipe handling. A Cameron 18.75in 10K blowout preventer (BOP) is installed onboard the drilling vessel to prevent sudden oil pressures and uncontrolled flow forcing its way back up the drillpipe. This is controlled with the help of pilot hydraulic valves comprising four ram and one annular cutter. The vessel has a raised catwalk of NOV-CWM P10-45-HB type with a maximum load carrying capacity of 15t, tubular length of 18m and tubular diameter of 36in. The drilling ship is fitted with NOV HydraTong ARN-200 iron roughneck onboard used for makeup / breakout of drill pipe, collars and casing. The maximum makeup torque is 100,000ft-lbs and the maximum breakout torque is 145,000ft-lbs, with a tool joint range of 3.5in-9.75in. Other equipment aboard the vessel includes Halliburton’s HCS 25E Advantage cementing system skid and three 1,600HP, 5,000psi mud pumps supplied by NOV. Two additional pumps for hopper, sack cutting and mixing chemicals and a 49.5in false rotary table are also provided. Kongsberg supplied its K-POS SDP 22 and K-POS SDP12 dynamic positioning systems (DPS) for the vessel. Position reference systems include two Simrad HiPAP 500 underwater positioning system, a light-weight taut wire (LWT) MK 15/500, a Fanbeam Mk 4.2 2000, Kongsberg’s RADius 1000D and Seapath 200. The ship also includes three units of differential global positioning systems (DGPS). Communication equipment onboard the drilling vessel includes the Global Maritime Distress and Safety System (GMDSS) for maritime distress and safety communications, and KU-band and C-band satellite communication systems. The vessel’s cabins and offices are connected to a satellite phone system. Safety equipment aboard the vessel includes four life boats supplied by Umoe Schat Harding, two boats capable of accommodating 45 people and another two accommodating 63 people. One Norsafe Magnum fast rescue craft (FRC) used for man overboard (MOB) and two life rafts supplied by Viking for marine evacuation systems (MES), capable of carrying 101 people each, are featured onboard. "The propulsion system allows the vessel to cruise at a maximum speed of 14k." Fire-fighting facilities include two fire pumps, each with a capacity to spray 205m³ of water per hour at 11.7bar, fire and gas monitoring equipments by Drager, and a public address and general alarm (PA/GA) system supplied by Zenitel. The vessel is also equipped with a Marioff HI-FOG system within the accommodation and engine rooms. It is equipped with a K-Safe 700 emergency shutdown (ESD) system and a Kongsberg Maritime automation and power management (PMS) system. Norshore Atlantic is powered by four MAK 9M25 and two MAK 6M25 diesel engines. The vessel features four AvK DSG 125 and two AvK DSG 114 diesel generators, supplied by Cummins Generator Technologies, providing a total power output of 14,400kW. The propulsion system includes two Rolls Royce azimuthing pulling propeller (AZP) 120 thrusters with a rated capacity of 3,000kW each, and three tunnel thrusters including two 1,500kW RollsRoyce TT 2400 thrusters fitted forward and one RollsRoyce TT 1800 with a capacity of 660kW fitted at the aft. A RollsRoyce UL2001 azimuth thruster with an output of 1,500kW and a Caterpillar emergency generator with an output of 500kW are also fitted. The propulsion system allows the vessel to cruise at a maximum speed of 14k.